A key component to any adventure is the base camp—the place where you plan, gear up, and fuel up beforehand, then rest afterward to do it all again. In the case of local activities, the base camp is your own home. In the case of extreme and remote expeditions, your base camp might just be a tent. But what if you could have the best of both worlds? What if you could transport the comforts of home to the solitude of high mountains, deep woods, or distant shores? You can, by staying at one of these 15 awesome adventure lodges. On this list are just a few of our favorite accommodations set in incredible outdoors locations throughout the U.S. and Canada. All of these are the doorstep to adventure. Some are even so remote that you can't drive to them, so you'll have to hike, boat, or fly in. Most of them provide a wide range for rooms and services, so you can choose what suits you best. You'll also find rental equipment and guided trips if you want to try something new. Check out these exceptional lodges, and you just might find your next big adventure. 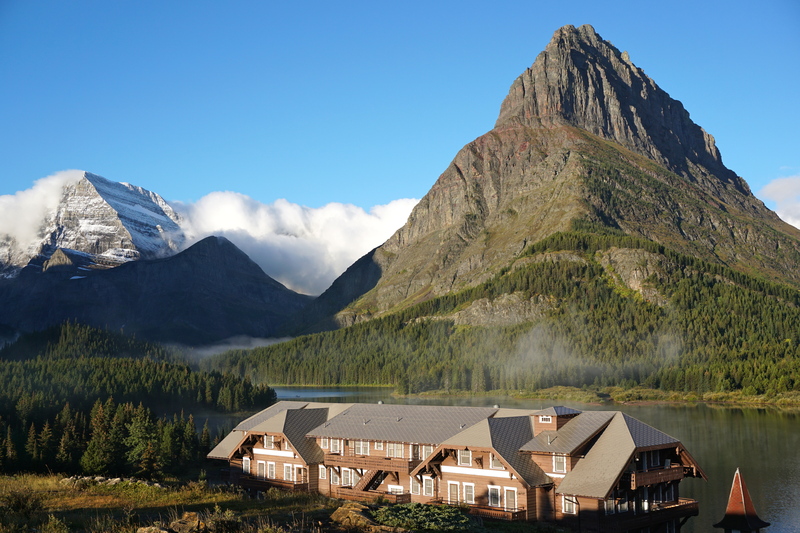 The historic Many Glacier Hotel was built by railroad tycoons in the age of westward expansion. Brent Uhrig. In a far corner of Glacier National Park you'll find an especially stunning setting: the conical hulk of Mount Gould towering over blue waters of Swiftcurrent Lake with snowy pyramidal peaks on either flank of the horizon. On the lakeshore, with a front-row seat to the view, is the Many Glacier Hotel, a historic lodge constructed spectacularly in Swiss mountain chalet style. It is central to all the recreation opportunities in this isolated region of the park including boat tours, paddling, hiking among surrounding mountains and alpine lakes, and viewing the powerful Swiftcurrent River Falls. This rustic resort is in a prime location for adventure in the Sierra Nevada. There are the Mono Hot Springs, of course, which occur naturally along the river just a few minutes' walk from the cabins. Then there are the streams, lakes, and mountains that surround in both the Ansel Adams and John Muir Wilderness. Hiking, swimming, horseback riding, and fly fishing are top activities, and guided trips are available. Mono Hot Springs Resort even includes cabins, which are charmingly constructed from local river rocks and wood, and have fairly basic amenities, in tune with the remoteness of the area. At the north end of Lake Chelan is the isolated community of Stehekin, reachable only by boat, sea plane, or hiking trails. The one road through town leads only to trailheads higher in the valley; it doesn't connect to anywhere else. The Lodge at Stehekin is a full-service resort for luxury travelers and backpackers alike. It has a restaurant, general store, kayak rentals, and shuttle service to the trails that go high into the glaciated peaks of the North Cascades. 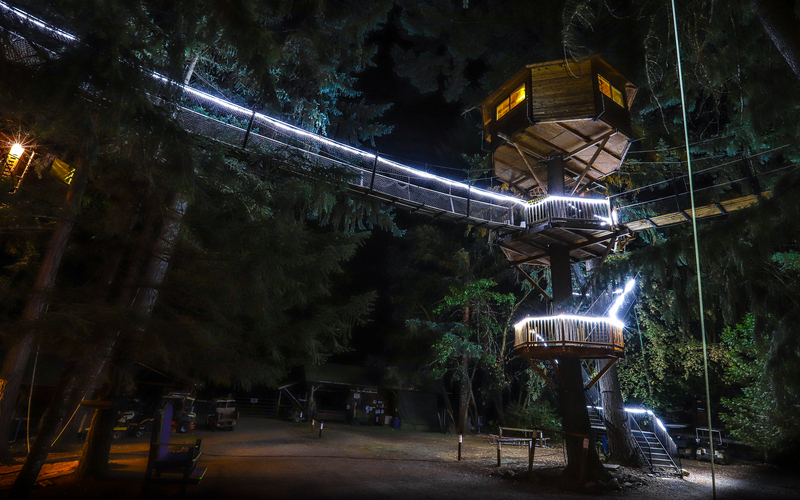 An oddity in the forests of Oregon, perhaps, but the Out 'N' About Treehouse is a welcome one. Shaun Hunter. In the towering forests of Oregon is something you won't find many other places on Earth: treehouse cabins nearly 50 feet above the ground. The unique "treesort" accommodations are suspended nearly completely, with staircases and bridges accessing the cabins. On the ground beneath the canopy are fun community spaces like a fire pit, picnic area, kitchen, swings, disc golf course, and a natural river-water swimming pool. There is also a zipline course in the trees. If you want even more options than that, Out 'N' About Treehouse Resort is convenient to trails and rivers in Siskiyou National Forest and Illinois River Forks State Park. Just outside of Santa Cruz is the cozy forest getaway at Fern River Resort. The property is along the San Lorenzo River and backs up to Henry Cowell Redwoods State Park, which has giant old-growth groves and plenty of hiking trails. It is also right next to the quirky historic town of Felton, with attractions like a Bigfoot museum, a covered bridge, and craft breweries. Within a slightly larger radius from the resort are Santa Cruz's famous mountain biking trails in the hills and surf spots on the coast. The small community of Allenspark is just outside Rocky Mountain National Park and practically at the foot of Longs Peak, one of its most iconic 14,000-foot mountains. 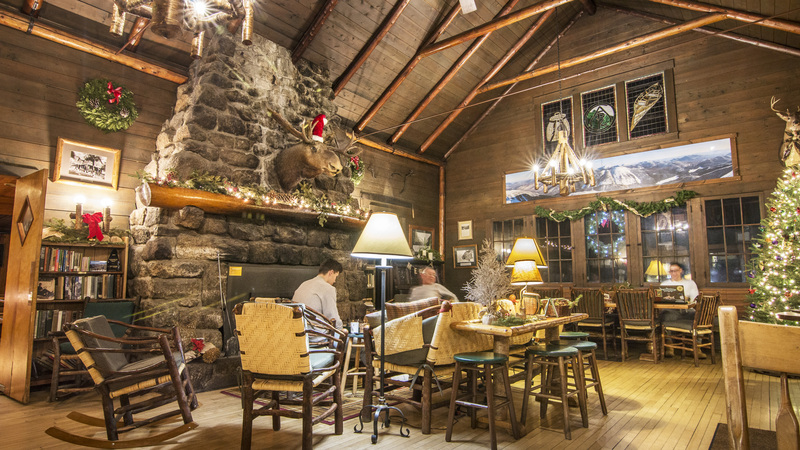 The Allenspark Lodge Bed & Breakfast is a historic log-cabin lodge with cozy private rooms plus a communal dining room and living room with a fireplace. The location is highly convenient to destinations in the national forest like Taylor Mountain Trail and Ouzel Falls, Bluebird Lake, and a wealth of remote terrain higher in the mountains in the national park. 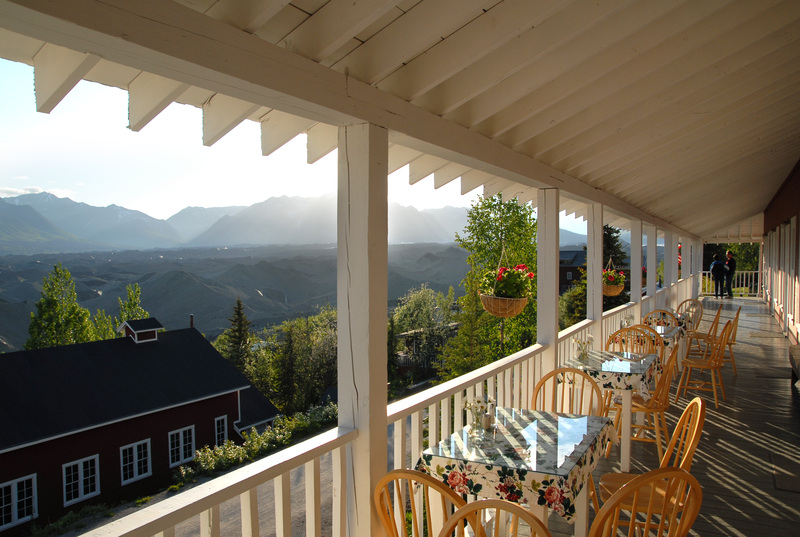 Porch views at Kennicott Glacier Lodge are legendary, overlooking Wrangell-St. Elias National Park. Tyson Gillard. Wrangell-St. Elias is America's largest national park by land area. Though most of its vastness is left wild and remote, there are activities for all types of visitors to enjoy near the lodge, which is located right next to a massive glacier beneath some of America's tallest mountains. Hiking, backpacking, wildlife spotting, glacier trekking, ice climbing, and whitewater rafting are all possible on your own or with a guide. You can drive to Kennicott Glacier Lodge, but the journey is long and the last 60 miles are on gravel, so many people choose to fly in. Arnott's Lodge & Hiking Adventures is a friendly, mellow resort in a great location near Hilo. It is just across the street from a beautiful black-rock beach and within walking distance from other popular beaches and waterfalls. You can rent a bike to get around even faster, and Arnott's provides free information as well as guided tours for hiking and other excursions in the area. Hawai'i Volcanoes National Park is less than an hour's drive away. The lodge accommodates all types of travelers, with budget options like camping and dorm-style rooms in addition to nicer private rooms. The Adirondack Loj is best by firelight. Nick Catania. Located beside the aptly named Heart Lake, the Adirondack Loj is nestled in the heart of this magnificent mountain range and near New York's highest summit, Mount Marcy. Year-round recreation is just outside the door, from summer swimming and hiking to fall foliage to winter snow and ice sports. The Loj has comfortable private and bunk rooms, community living space and game room, and delicious family-style meals. The Adirondack Mountain Club offers guided trips and gear rentals to fulfill your adventures. The charming Cardigan Lodge, run by the Appalachian Mountain Club, is supremely located in New Hampshire's central mountains, next to Cardigan Mountain State Park and near the Holt Trail scramble to the summit. The lodge has both private and bunk rooms. It operates full-service in the summer and self-serviced in the winter, so you can have your choice of New Hampshire's outdoor bounty at any time of year. Atop one of the East's highest mountains is a lodge that you can only reach by hiking. Mount LeConte rises to 6,593 feet in the Great Smoky Mountains. The historic LeConte Lodge on top is set among purple-blossomed rhododendrons, wild berry bushes, and fragrant fir trees with lofty vantage over surrounding summits and valleys. Four trails, but no roads, lead up LeConte. The rustic cabins and staffed kitchen are supplied by caravans of hard-working llamas, with whom you might happen to share the trail on your journey up the mountain. Heavy snows and highcountry comfort at Journeyman Lodge. Adam Cowcill. 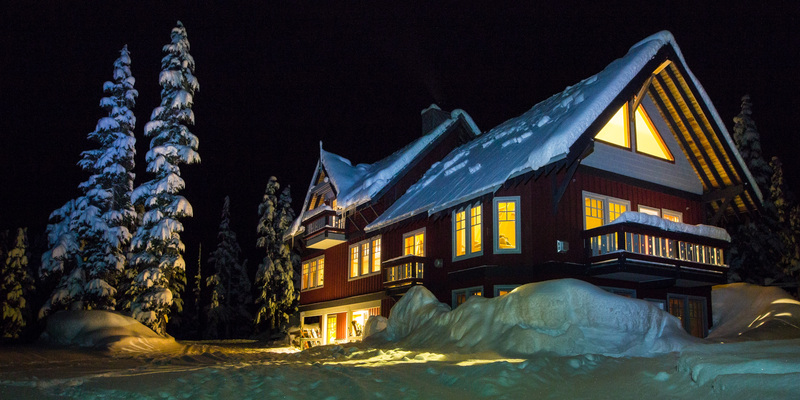 Tucked into the snowy backcountry of the Coast Range near Whistler is the Journeyman Lodge, which you can only reach by skiing, riding a snowmobile, or flying by helicopter. The lodge is quite large and well-equipped despite its remoteness, though, and has a variety of comfortable room types as well as common space. Its all-inclusive packages cater to cross-country and alpine ski touring, with guided trips and snowcat trips available. Located within Fundy National Park and right near the water of the bay, the Fundy Highlands Inn and Chalets are your perfect base camp to exploring this extraordinary area. Close by are destinations like Dickson Falls, Point Wolfe Beach, and Bennett Lake, but you may be tempted to stick around the inn because of its inviting amenities. There is a heated saltwater swimming pool, patio overlooking the bay, communal grills, and plenty of private space as well. You can sit on your room's veranda and witness the extreme difference between high and low tides, greater here on the Bay of Fundy than anywhere else in the world. This no-frills retreat caters to backpackers and frugal travelers visiting Banff and Jasper. Rampart Creek Hostel is unbeatably located in between the two parks in the North Saskatchewan River Valley. Hiking trails along the creek and to an overlook begin right on the property, and an easy drive away are highlight destinations like Bridal Veil Falls, Siffleur Falls, and the Athabasca Glacier. The hostel is mostly communal space, with bunkhouses for accommodations, a shared kitchen, reading room with information on the area, outdoor fire pit, and even a wood-fired sauna next to the creek. Lake Esnagi is so far out in the woods of Ontario that no public roads reach it. Fish and wildlife abound because the land is so scarcely affected by people. This lake is renowned for its fishing, but you have to work for it. You can only get to the Lake Esnagi Fishing Lodge by train or float plane. Once there, you'll find private cabins that are simple yet comfortable, a boat for your own use, and fishing guides available for hire. The lodge encourages an eat-what-you-catch ethic and offers help in cleaning and preparing your catch.